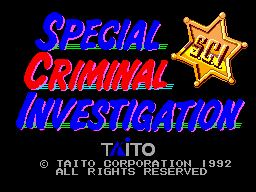 Special Criminal Investigation, known often simply as S.C.I., is a action-driving game released by Taito for the arcades in 1989. It was subsequently ported a variety of consoles and computers including the Sega Master System in 1992. Special Criminal Investigation is a sequel to Chase H.Q., with some versions of the game going so far as to call it Chase H.Q. II: Special Criminal Investigation. Aside from being part of the same series, it is unrelated to the Sega Mega Drive game Chase H.Q. II. Special Criminal Investigation is very similar to Chase H.Q. but contains a few key differences - two directional traffic, the ability to fire (and be fired at) and helicopters which occasionally fly by to drop off extra ammo. Predictably the Master System version takes a hit both in the audio and graphical departments. Many of the special effects are also cut. Main article: Special Criminal Investigation/Magazine articles. NEC Retro has more information related to Special Criminal Investigation.